and protect the right to vote. As a college student, you face a choice when you arrive on campus: vote where you attend school and live for the majority of the year, or vote absentee in your hometown. College marks the first time many young people are eligible to vote, and developing the habit of voting has a profound impact on involvement beyond college. 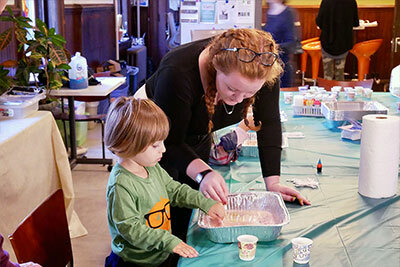 Election@Bard works to increase voter turnout by registering voters, developing elections-based programming to foster civic engagement, and fighting for voting rights. ...in a democratic society and we encourage all students to exercise the right to vote. The initiative facilitates voter registration for students, provides information about candidates, hosts forums in which candidates and students can meet, and protects the rights of students to vote and have their votes counted. 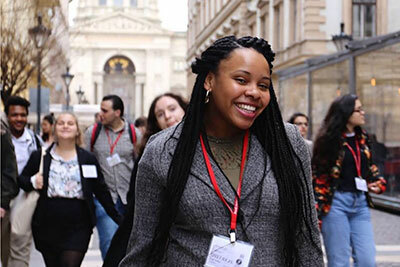 Since 2014, the initiative has been led annually by Bard’s Vote Everywhere Ambassadors, undergraduate students selected by the Center for Civic Engagement and the Andrew Goodman Foundation. Ava Mazzye is a junior at Bard College studying Political Studies and Spanish. In the summer of 2017, Ava became Team Leader of the Bard Vote Everywhere team, a subsidiary program of the Andrew Goodman Foundation. 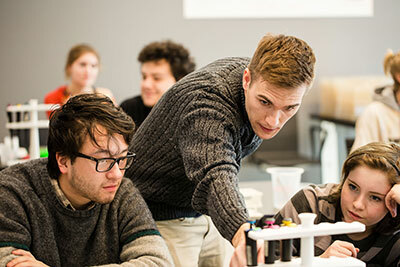 In her position, Ava focuses on registering, educating and engaging college-age voters. CCE Office Hours: Mondays 1:30 – 5:00 p.m.
CCE Office Hours: Tuesdays 1:30 – 5:00 p.m. & Fridays 1:30 – 5:00 p.m.
Voter suppression of college students in Dutchess County was rampant until 1999, when Bard and Vassar students—with the support of both institutions—threatened a lawsuit against the Dutchess County Board of Elections. In response, a committee appointed by the county legislature, consisting of the late Woody Klose, Kristen Jemiolo, and Marcus Molinaro (the current county executive), explored the issue and reaffirmed the right of college students to vote where they live and study, a right already upheld by the Supreme Court in 1979. The committee recommended that the County Board of Elections “encourage the franchise among students.” After the removal of Republican Election Commissioner William Paroli Sr. on unrelated corruption charges, students were permitted to register to vote. However, in the dozen years since, students have still faced periodic problems, including frivolous challenges at the polls and shifting requirements for providing proof of residence. 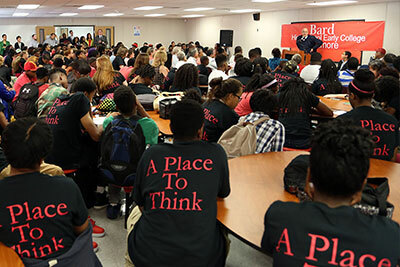 Bard has consistently advocated for student voting rights and attempted to ensure that students are properly registered. It has also supported litigation (as recently as 2009) to see that student votes are counted. Your rights are once again under fire. Election Commissioner Erik Haight has rejected the proposal to locate the District 5 polling site on the Bard College campus, which would make it safer for students, disabled voters, and those without cars. Tell Haight that polls should be where people are: contact him by calling (845)-486-2473, or emailing ehaight@dutchessny.gov. 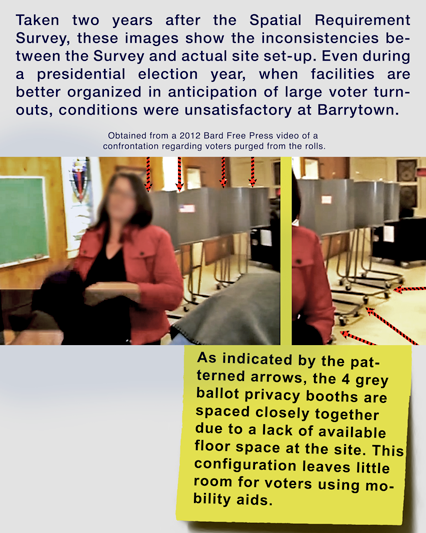 Election@Bard co-head Eva-Marie Quinones ’17 published this article giving background on the fight for an on-campus polling site. During the 2012 election season, voter registration forms were rejected from Bard, Culinary Institute of America, Marist and Vassar students. With the help of the NYCLU, a class-action lawsuit was filed against the Dutchess County Board of Elections. The affected students successfully challenged a decision by Dutchess County Republican Elections Commissioner Erik Haight to reject their applications because they didn’t list their dormitory name. In 2009, voter intimidation and a poorly written legal decision by Judge Brands in Poughkeepsie led to students being needlessly challenged at the ballot box. Many of those challenged students were required to vote via affidavit ballot, even if living at the exact same address where they were registered. This was an effective tool, as affidavit ballots are frequently disqualified over technicalities during the counting process. In 1999, Bard and Vassar students joined together to challenge Republican Election Commissioner William Paroli Sr.’s illegal impediments to student voter registration. In 2000, a bipartisan county legislative committee looked into the matter and concluded unanimously that not only do students have the right to vote locally, but “The Dutchess County Board of Elections should encourage the use of voting franchise among students.” Even so, it took Paroli’s conviction on an unrelated felony to produce change and allow students the right to vote where they live, work and study. This section shows the candidates on the ballot for students registered locally. If you’re registered elsewhere, use this tool from Ballotpedia to find your sample ballot. Election@Bard provides shuttles from Kline Bus Stop to polling places on Election Day. Look out for details ahead of an election! Are you registered to vote out of state? Do you need an absentee ballot? Click here to apply for one. College students can vote in their home district or at school. The Center for Civic Engagement hosts voter registration events on campus during Language and Thinking and ahead of every election. Watch your email and the Bard app for details. On-campus residents who wish to vote locally, in-person, may download a pre-formatted form below. On election day, we provide free polling-place shuttles for on-campus registered voters. Your on-campus registration remains active until you move off-campus. You must input your Bard College mailbox number in the blank field, MSC#___. For Section 13, you must input either your NYS Driver’s License number or the last four digits of your Social Security number. For free mailing, drop your form off at the Campus Center Voter Registration Dropbox. If you would like a free voter registration form and help registering, drop by the Center for Civic Engagement (Manor Gatehouse). Off-campus residents are located in different voting districts and must register to vote using their off-campus housing addresses. Students should re-register at their new address if they have moved since their previous registration. Once they have been successfully registered to vote, off-campus residents will receive a postcard informing them of their polling place. For Section 13, you must input either your NYS Driver’s License number or the last four digits of your Social Security number. Click here to complete a voter registration form online. The form must be printed and mailed. Submit an Absentee Ballot Request Form. Be sure to confirm whether your home state allows first-time voters to vote by mail. I forgot . . . am I already registered? Use the website linked here to confirm whether you’re already registered by choosing a state and inputting the required identifying information. Our voting district’s population center is here at home, at Bard. Why must we travel 3 miles to vote? This concern follows a history of voting accessibility issues for college-age voters in Dutchess County. In 1979, the U.S. Supreme Court ruled in Symm vs. The United States that denying college students the presumption of bona fide residency was unconstitutional. Decades after that decision, college students in Dutchess County faced undue and unjustified barriers to voting. The egregious disenfranchisement tactics occurred consistently until 2004. During that time, young registered voters in Dutchess County were systematically barred from voting through the use of a “supplemental” questionnaire. The Board of Elections required this supplemental form exclusively from voters residing at college residences. The practice ended in 2004, after students and administrators from Bard, Vassar, and Marist, civil rights organizations, and a bipartisan group of local elected officials united to put an end to this unjust practice. Since then, conditions have improved, but litigation was required in 2009 and 2012 to ensure the equal treatment and enfranchisement of college-age voters. In addition to the unnecessary distance, the polling site is located on an unlit and high-speed county road that has no pedestrian sidewalks. The present polling site is irrefutably inaccessible by foot. 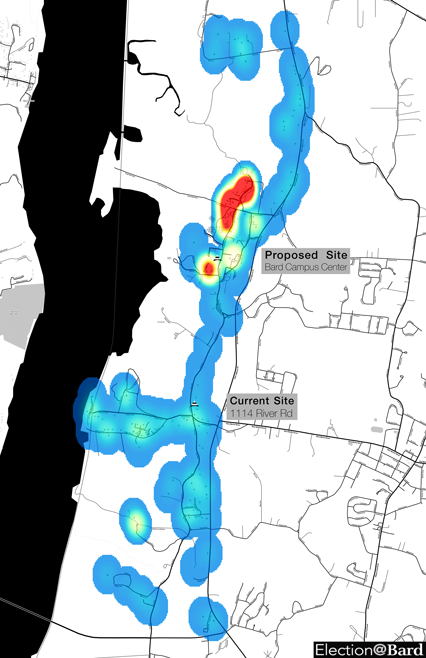 A polling site on Bard’s campus would be immediately accessible by foot to 68 percent of all voters in this voting district. Furthermore, the current polling site is inaccessible by mass transit. However, a polling site at Bard College would be accessible by LOOP bus. It is important to note that, in 2010, NYS Election Law was amended to give preference to sites accessible by mass transit; “each polling place designated, whenever practicable, shall be situated directly on a public transportation route” (NY Elec L § 4-104  [a]). How far are we from the polls? There’s a collection box at the InfoDesk. Shuttles will run on Election Day from the Kline bus stop to the polling site at St. John’s Episcopal Church in Barrytown every 20 minutes from 9:40 am to 8:40 pm. 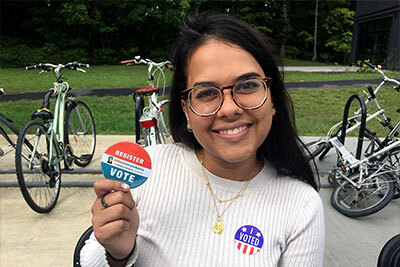 If you believe you should be registered at Bard College’s 30 Campus Road address, but you're not certain, please contact us at election@bard.edu. If you would like to confirm your registration status in either Red Hook or Tivoli, please contact us at election@bard.edu.